Aircraft information window now correctly states 'aircraft is flying visual circuit' (as opposed to 'visual circle' pilots' slang). PC\Linux\Mac interoperability and compatibility & weather engine testing build. Details for CAT-group members only. 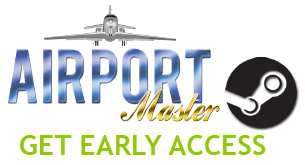 Navigation: MONET intersection (north of airport, over the low mountains range) SIDs (MONET 1B & MONET 5C) and STARs (MONET 3B & MONET 8Y) are now enabled and in game, available to be used as departure and arrival routes for runways 17 and 35 respectively. Added new aircraft type Pontius PC-13 NG (real-life prototype Pilatus PC-12), high performance passenger single turbo-prop. Two units were delivered to SkyFly airline (E-DKTC & E-DBGF), one unit to FongAir (N307R). 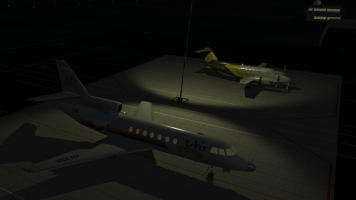 Private operators received GR-NLT (a symbolic aircraft livery to commemorate Airport Master being greenlit on Steam Greenlight in Jan 2017) and TN-JAK. Implemented support for ORBIT RIGHT (instead of going to HOLD over VOR) at ILS APPROACH clearance if traffic is tight on final (latest traffic cleared' distance to approaching aircraft is less than safe separation distance) - ATC still may elect to give HOLD VOR or HOLD NDB or ORBIT AND BACK ON LOCALIZER traffic separation instructions. Implemented TimeSkip feature - now at any time there's no activity at the airfield (no active flight clearances, no taxi clearances, no service vehicle jobs and no daily events in progress (such as Saly payouts, runway inspections, fire and rescue team drills etc) - the TimeSkip icon appears in top left corner of main game screen UI with information to what time and what next event a Player can skip time to - this may be either a flight (arrival, departure, local) or some scheduled event periodical or one-time. Upon clicking TimeSkip icon - the game world fades to dark for a second and then time and events advance to given day\time. This is very important game mechanics allowing for uninterrupted endless gameplay! Note: during TimeSkip phase all financial operations are simulated: i.e. 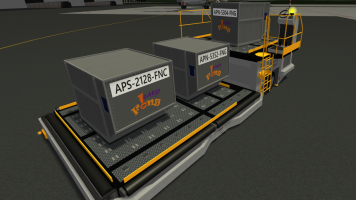 all vending machines in Terminal building continue to work but yield reduced profit - so if a Player early in the game completes daily flights service and it's night-time and the next flight is early in the morning and Player elects to skip time to that point, vending machines will approximate reduced sales of items during night-time, if stocks are depleted they will take same amount of time to be re-filled at same cost (so cost-profit will not change to this aspect), but overall sales of vending machines will be reduced at least by half during TimeSkip. Same works (with minor exceptions) for all time-dependent businesses. Added electronic advertising stands to ground and second floor (will become purchasable items in future versions). Stands display customer's ads in slideshow mode. It is planned (as a part of larger airport customers relations model) that upon signing a contract with airline, Player will be able to offer advertising spots for said airline within terminal premises and on outside walls facing the city (for now these four ads spots are reserved for competition battle between BusyJet and TravelAir in career game mode), however electronic ads displays in passenger area are not and can be used by Player to invoke direct and indirect profit. New type of on-screen notifications added: simple info - this type of notification does not require user to manage anything and is used to display information messages only such as: runway inspection is underway, salaries been paid at due time etc. Clicking a simple info message in the list removes this notification. New type-specific sounds for E30P recorded at the hangar and on service parking on the real 300: gear extension\retraction, flaps motor, engine startup, idle and rev up \ rev down - all thanks to Tony! PC\Linux\Mac interoperability and compatibility testing build. Details for CAT-group members only. Added new aircraft type Tucnal P2005T (real-life prototype Tecnam P2006T), the lightest certified twin-engine aircraft in the world. 3 aircraft of that type are added to the game: DG-SZG, N811C, N113Y - all operated by private pilots. Working arrivals\departures screens are added to arrivals zone (installed on baggage carousel), also fixed other information screens sizes and positions in Terminal building. Fixed an annoying bug when clicking some of the UI panels which were drawn over the aircraft caused the mouse click to trigger UI events associated with said aircraft (inadvertent click-thru). New Meteorology office UI added - displays METAR, TAF (once weather prognosis updates are acquired by player), decoded weather info as follows: meteo conditions (IMC or VMC), LVP (whether are in effect or not), horizontal visibility, ceiling, wind on ground, pressure (QNH & QFE), temperature and dewpoint, temperature at 3000ft, FL70 and FL110; also data from various player-upgradable sensors is displayed in meteo-screen. All information is presented in aviation-specific format and expandable easy-read view for new players, all values have cross representation between metric and imperial units. Game Day (not to be confused with day of week) added to the game chronology - this is purely statistical parameter, displaying how many full days passed in game world since the game started. It will be used later in statistics and achievements. Initial public Alpha release including release on Steam Greenlight.